„Civic participation or civic engagement are important which in the recent years have resonated not only with social scientists, but arguably also with a broader public. Therefore, it can be a worthy task to try to apply those concepts to a particular group of countries and to determine how useful they are in analyzing political phenomena. 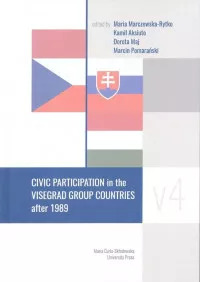 This was the goal of the editors and authors of the monograph Civic Participation in the Visegrad Group Countries after 1989. And since post-communist societies are often said to be suffering from destructive effects of the previous political system on citizenship ethos, the choice of the target of the research seems only logical”.